Just minutes from downtown Phoenix, Ariz., the Pointe Hilton Squaw Peak Resort feels like a Southwestern oasis, nestled into the Phoenix Mountain Preserve. Divided into separate areas, the resort can feel overwhelming when first walking in, but that’s part of the charm. Private casitas (homes) are tucked away in their own residential area, where block parties take place during spring break and summer months, and north and south buildings feature three to four stories of accommodations overlooking courtyards and pools. The entire resort features lush desert-friendly landscaping like palm trees and various cacti and desert flowers, with hummingbirds and morning doves flittering about and the rugged mountains providing an idyllic backdrop. More than 500 suites are perfect for families, with separate sitting and bedroom areas and rooms accommodating up to six and private casitas accommodating up to eight, not to mention the connecting suite options for even larger families — typically unheard of in the hotel world! 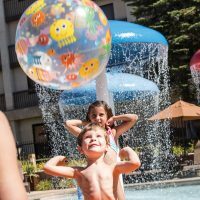 Once settled into your vacation home for the week or weekend, kids can enjoy the Coyote Camp kids’ program, and won’t want to miss the lazy river, water slide and large main pool. Need a little more relaxation? The resort’s spa provides pampering services for all ages. (Yes, kids, too!) With onsite dining and kitchens in casitas, there may not be any reason to leave the Pointe Hilton Squaw Peak Resort to experience the perfect family vacation. The Pointe Hilton Squaw Peak is an all-suite resort with 563 suites spread out across the main building, North building, South building and private casitas. Each suite features a living room with a sleeper sofa, private bedroom with two double beds or one king bed, patio or balcony, mini-fridges, separate sink area, bathtubs and ample closet space for longer stays. Suites can accommodate up to six, with connecting suites available for even larger families and multigenerational trips, hosting up to 10. One- or two-bedroom casitas, of which there are 100, wrap around private streets with garage parking spaces, full kitchens (with microwaves instead of ovens), oversized patios and balconies and upstairs bedrooms separated from the downstairs living space with a pullout sofa. The casitas can accommodate up to eight, with larger families able to request neighboring casitas for a full "house" accommodating up to 16. Each suite features complimentary Wi-Fi, two flat-screen TV's and coffee makers. Visited as part of our spring break and it really is a nice hotel. We did not have any of the issues noted in some of the other reviews. The room was nice and perfect for our family of 5 - with two double beds in their own room and pull out couch in the front room. The kids loved the pool and lazy river - and we did too. Rico's food was solid. A great place to unwind for a couple of days and let the kids have fun. Great resort for the money! Not sure why this place got bad reviews. The resort was very nice. Yes rooms are dated but spacious. Beds need to be updated. Pools are awesome. Lazy river was fun. Great resort for kids. We were with another couple and had a great time even without kids. Food by pools are good. Food at hole in the wall not very good. Many great restaurants off property. Shuttle will take you 5 mile radius. Also hiking g near by. Staff was not very friendly except Billy the valet guy. Overall for the money great resort. One of the best looking children's facilities we've seen, Coyote Camp looks more like a relaxing school library with a large library of its own featuring Southwestern tales and a massive puppet show theatre decorated to look like the rugged desert surroundings around Phoenix. The center's current leader, Jane, is a former teacher and has headed up the program for more than 20 years, with many of her staff also former teachers. The supervised programs for children ages 4 to 12 are offered daily with a summer camp so popular that local children attend. Full- and half-day programs are available from 9 a.m. to 4 p.m., with special evening hours, 6 to 9 p.m., offered Wednesdays through Saturdays. Full-day fees are $65 per child and include lunch. Half days, from 9 a.m. to noon or 1 to 4 p.m., are $35, without lunch. Half days with lunch, from noon to 4 p.m., are $45. Evening programs are $35. Additional children receive 20 percent off on full-day programs only. Programs include arts and crafts, swimming, pizza and tortilla making, gold panning and more. 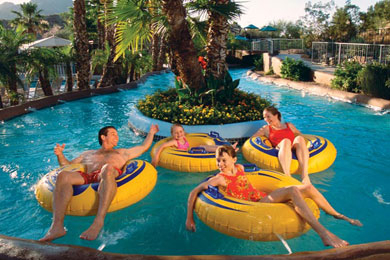 Spanning four acres, the River Ranch features a lazy river for slow tube rides, swimming pools and water slides, as well as an 18-hole mini golf course. The river passes through Tombstone, an area of the resort decorated to mimic the Old West. The main pool hosts dive-in movies on Friday evenings. Younger kids are welcome to this resort spa, with a special collection of offerings for children 12 and under. Young kids can try Nap Time Massages, Fruit Punch Scrubs, Cutie Pie Facials and Ice Cream Manicures, Pedicures or Combos that include a special ice cream treat. Teens can also enjoy special Teen Facials and the Teen Queen for a Day treatment, which is a two-hour special featuring a massage, facial, manicure and ice cream. The spa is open for treatments from 9 a.m. to 7 p.m. (5 p.m. on Sundays). Children must be 14 and older to use the spa's fitness center, which is open from 5 a.m. to 9 p.m. The spa's pool is available for those 18 and older. The resort features seven pools, including the main pool at the Hole-in-the-Wall River Ranch. The North and South accommodation areas each have their own pools, as do the casitas. The resort will be adding cabanas around the main pool, with rentals available for families to have covered, reserved poolside seating. There are four hard tennis courts located on the property, with a tennis professional available for lessons. A basketball court is also located on the property. Located in one of the resort's original 1940s ranch houses, the Hole-in-the-Wall is a casual dining environment featuring breakfast, lunch and dinner daily. This rustic environment provides indoor and outdoor seating near the resort's lazy river and serves up down-home BBQ and all of the 'fixins. The Joshua Stone Band plays live music for dinner and dancing, and S'mores can be toasted around the fire pit on Wednesdays and Saturdays. This casual restaurant offers a breakfast buffet and an a la carte menu, as well as a casual spot for lunch and dinner. Located in its own building in front of the hotel, the restaurant is a popular spot for locals, as well. All-American classics are featured with a Southwestern twist. For poolside dining, Slim Picken's offers "Happy-tizers," salads, flatbreads and traditional lunch entrees. A variety of ice-cold beverages and a little kiddos menu are also available. Hours are from 11 a.m. to 5 p.m. daily. Head over to Rodeo Drive's store for ice cream and coffee at Castle Cactus Rock Creamery, located in the back of the store like an old-fashioned ice cream parlor. Room Service is offered for breakfast (7 to 11 a.m.) and dinner (5:30 to 10 p.m.). This resort is pet-friendly and accepts dogs up to 100 pounds. Onsite laundry facilities are located on the property for families enjoying longer stays. Phoenix enjoys sunny and warm weather throughout the year, with summer desert temperatures getting quite hot. Because of the summer heat, summer is the city's low season for visitors, and guests can find great hotel rates if they are willing to deal with the heat (by a pool!). Spring break and holidays are high season at the resort, where rates will be a bit higher. Fall provides fantastic weather and is less crowded, with deals for those that can travel in October and November. The resort is located 20 minutes from Sky Harbor International Airport. 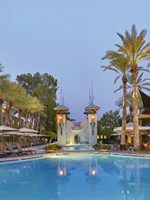 Transportation can be arranged by the hotel (at a fee), but most visiting Phoenix will want to rent a car to explore the dual cities of Phoenix and Scottsdale.